While promising Hope and Change, Obama's real promise is clearly being translated as Hopeless Corruption. The pick of Clinton Administration figure Eric Holder who was criticized in a Congressional report for ethical violations involving the infamous pardon of fugitive criminal Marc Rich, followed by the appointment of corrupt Clinton Administration figure and Freddie Mac board member, Rahm Emanuel. There were figures in the Clinton Administration who were dirtier than Eric Holder, but not many and Eric Holder's career both before and after his time in the Clinton Administration is a very ugly one. Let's begin with Pardongate, when Eric Holder was involved in giving his nod to the pardon of fugitive tax cheat Marc Rich and in withholding information from the Justice Department. A Justice Department that he will now ironically head as Attorney General. "A forthcoming Congressional report on the last-minute pardons by President Bill Clinton says Deputy Attorney General Eric H. Holder Jr. was a "willing participant in the plan to keep the Justice Department from knowing about and opposing" a pardon for Marc Rich, the financier. The 476-page report, a copy of which was obtained by The New York Times, harshly criticizes the Clinton White House for its handling of the 177 pardons and commutations granted on its last day. The most controversial pardon went to Mr. Rich, a commodities trader who fled the country in 1983 rather than face trial on charges of tax evasion, racketeering and trading with the enemy. The report says that Mr. Rich's lawyers tried to circumvent prosecutors, who would oppose the pardon, and take their case straight to the White House. Mr. Holder, the report says, played a major role, steering Mr. Rich's lawyers toward Jack Quinn, a former White House counsel. Mr. Rich hired Mr. Quinn, whose Washington contacts and ability to lobby the president made the difference, according to the report. It says that Mr. Holder's support for the pardon and his failure to alert prosecutors of a pending pardon were just as crucial. It's 8 years later but the Crook Fairy finally granted Eric Holder his wish to become Attorney General. And Obama has an Attorney General who conspired in the illegal pardon of a fugitive criminal in the hopes of making himself Attorney General. Criminal doesn't even begin to describe this. Eric Holder belongs in a jail cell on charges of conspiracy, instead of being put in charge of the same Justice Department he tried to sideline to serve his own political ambitions. Of course Eric Holder's slime trial doesn't end there. Pardongate also involved the pardons handed out to Weather Underground terrorists Linda Evans and Susan Rosenberg who were transporting 740 pounds of explosives for use in bombings. Here is what those 740 pounds of explosives were intended to do. On May 11, 1985, she was arrested again, charged and then convicted of acquiring weapons, fake IDs and safe houses, and of terrorist actions. Her targets included the U.S. Capitol Building, the National War College, the Navy Yard Computer Center, the Navy Yard Officers Club, Israeli Aircraft Industries, the FBI and the New York Patrolman's Benevolent Association. In her possession were 740 pounds of dynamite. Evans was sentenced to 40 years in prison. Certainly targets Al Queda itself would have approved of. And now Obama has an Attorney General that Bill Ayers and Marc Rich have thoroughly vetted. But that's just the tip of the iceberg when it comes to Eric Holder and terrorists. Eric Holder also backed clemency for 16 FALN terrorists, withholding information from Congress and even Attorney General Janet Reno and overriding the FBI's own opposition to clemency for the FALN terrorists who were part of a terrorist campaign that included a wave of terror carrying out 130 bombings over nearly a decade. "Holder, a Barbadian immigrant's son who grew up in Queens and received his law degree from Columbia, has played major roles in the probe of Democratic funny-money in the 1996 elections, the Sexgate scandal and the recommendation to President Clinton on whether to free FALN terrorists from jail. A list of FALN documents withheld from Congress shows that many memos on the FALN clemency decision went directly to Holder, while Reno's role was minimal." This allowed Eric Holder to sideline his own boss and the Attorney General and playing the key role in freeing the FALN terrorists. Which proved to be a convenient way of blocking and dead ending the objections of the FBI and just about everyone involved in the case. said. Holder declined to comment." Nor was Eric Holder simply approving request pardons. Instead he was working on freeing the FALN terrorists, even though they had not made any such request... and was actually passing messages along to them to make a show of remorse in order to move the process along. In 1997, Holder Met With Three Members Of Congress And Made Recommendations To Them About How The FALN Members Could More Easily Be Granted Clemency. "The committee's documents show that Mr. Adams and Eric Holder, the Deputy Attorney General, met on Nov. 5, 1997, with Representative Luis V. Gutierrez, Democrat of Illinois, and Representatives Jose E. Serrano of the Bronx and Nydia M. Velazquez of Brooklyn, both Democrats, to discuss the case of the Puerto Rican inmates. According to Mr. Adams's notes, Mr. Holder told the members of Congress that because the prisoners had not applied themselves for clemency this could be taken that they were not repentant, and he suggested that a statement expressing some remorse might help. In their testimony today, both Mr. Adams and Mr. Holder declined to answer several questions about how the clemency decision was reached, citing executive privilege. Both said, however, that the Justice Department had acted appropriately throughout the process." Clearly Eric Holder was fixated on freeing the FALN terrorists. So fixated that he was willing to sideline procedures, behave unethically and possibly even illegally. Arguably after this, Eric Holder should not be able to hold any position in the government, let alone that of Attorney General. How wrong were Eric Holder's actions? So wrong that FALN afterward was identified as a National Security Threat. A Subsequent Clinton Administration Justice Department Report Identified The Group As An "Ongoing Threat." "The Puerto Rican nationalist group FALN, 16 of whose members were pardoned by President Clinton in August, poses an 'ongoing threat' to national security, according to a September report by Attorney General Janet Reno released yesterday during a combative Senate hearing on the clemency decision." Eric Holder's work on behalf of FALN resulted in a special congressional measure to reform the process. And this is the carnage that Eric Holder's FALN buddies inflicted on the people of New York and the NYPD. The editorial is written by the Director of the World Trade Center Memorial Foundation and the sister of one of the pilots who died on 9/11. It was nearly 10 p.m. on New Year's Eve, 1982. Two officers on New York Police Department's elite bomb squad rushed to headquarters at One Police Plaza, where minutes earlier an explosion had destroyed the entrance to the building. Lying amid the carnage was Police Officer Rocco Pascarella, his lower leg blasted off. "He was ripped up like someone took a box cutter and shredded his face," remembered Detective Anthony Senft, one of the bomb-squad officers who answered the call 25 years ago. "We really didn't even know that he was a uniformed man until we found his weapon, that's how badly he was injured." About 20 minutes later, Mr. Senft and his partner, Richard Pastorella, were blown 15 feet in the air as they knelt in protective gear to defuse another bomb. Detective Senft was blinded in one eye, his facial bones shattered, his hip severely fractured. Mr. Pastorella was blinded in both eyes and lost all the fingers of his right hand. A total of four bombs exploded in a single hour on that night, including at FBI headquarters in Manhattan and the federal courthouse in Brooklyn. The prisoners were convicted on a variety of charges that included conspiracy, sedition, violation of the Hobbes Act (extortion by force, violence or fear), armed robbery and illegal possession of weapons and explosives -- including large quantities of C-4 plastic explosive, dynamite and huge caches of ammunition. Mr. Clinton's action was opposed by the FBI, the Bureau of Prisons, the U.S. attorney offices that prosecuted the cases and the victims whose lives had been shattered. In contravention of standard procedures, none of these agencies, victims or families of victims were consulted or notified prior to the president's announcement. "I know the chilling evidence that convicted the petitioners," wrote Deborah Devaney, one of the federal prosecutors who spent years on the cases. "The conspirators made every effort to murder and maim. . . . A few dedicated federal agents are the only people who stood in their way." A few dedicated Federal agents stood in their way... and future Attorney General Eric Holder stood in the way of the dedicated Federal agents. We can only imagine what Eric Holder will perpetrate as Attorney General, what crimes he will cover up, what terrorists he will aid and loose on the American public. He has proven himself all too well in the Clinton Administration as the best friend that terrorists and criminals with political influence could ever hope to have. For Joe Connor, whose father was murdered by FALN terrorists in a bombing only blocks away from the World Trade Center, Eric Holder's corrupt actions on behalf of the FALN terrorists carries a great personal price. During the 1970s and '80s, the FALN waged a war against the people of the United States that included 130 plus bombings. 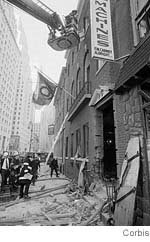 Their most heinous attack was the January 1975 lunchtime bombing of Fraunces Tavern here in New York City. It killed four people, including my father, Frank Connor, 33. Until then, President Clinton had denied clemency in 3,039 out of 3,042 cases. It's also worth noting that the Clinton administration consulted with representatives of the terrorists - but ignored the families of their victims. I was trying to make the point that the release of the FALN killers would send a frightening invitation to other would-be terrorists. Little did I know that more anguish was yet to come. Almost two years to the day after my Senate testimony, my father's god son, our cousin Steve Schlag, was killed on 9/11. My brother and I watched in helpless horror from our downtown offices, ironically only blocks from Fraunces Tavern. The 9/11 connection is not accidental. Freeing terrorists sends a signal of weakness to other terrorists. Eric Holder's work on behalf of the FALN terrorists 2 years before 9/11 amounted to demonstrating that you can brutally participate in murder of NYPD officers and New Yorkers and walk away from it with the Federal Government on your side. But Eric Holder's terrorist ties don't end there. Once out of the White House and working as a lawyer at Covington and Burling, Eric Holder represented Chiquita when the Justice Department charged the company with engaging in transactions with terrorists for the millions of dollars in protection money that Chiquita paid to Columbia Narcoterrorists. And then of course back in the Clinton Administration days, Eric Holder was a big fan of using force... not against terrorists, but against a 6 year old boy and his unarmed family. Eric Holder played a key role in the armed abduction of Elian Gonzalez by an army of border patrol agents with automatic weapons pointed at his head. adequately protected.' Apparently no guns were found." Just to clarify this, ruthless force had to be used because there was supposedly intelligence that there were guns in the house, though Eric Holder has no idea if there were any guns in the house or whether any guns were found in the house. As Debbie Schlussel points out, Eric Holder's appointment along with Greg Craig reunites 2/3rds of the Elian Gonzalez kidnapping team. We can only look forward to the kind of gruesome abuses of the justice system these two will perpetrate on behalf of Barack Hussein Obama. Of course Eric Holder was not too fussy to get involved in corporate crime either. And I don't mean on the prosecuting side. Eric Holder lobbied on behalf of Global Crossing, one of the 10 largest corporate bankruptcies since 1980, on a level with Enron and WorldCom. It was the 7th largest filing in American history. While Global Crossing was accumulating debt like mad, its executives were spending like mad, taking tens of millions in personal loans from the company, operating corporate jets, and selling as much inside stock as Enron. Meanwhile Global Crossing executives were covering their asses with a million dollar donation to Bill Clinton's library. The same bribe route used by Marc Rich, another Eric Holder beneficiary. Now guess who the auditor for Global Crossing was? Arthur Andersen, made infamous by its ties to Enron. And guess who was its lobbyist, Eric Holder. And just in case you think that the Eric Holder Scandal Train stops there, it's only the beginning of a long route which we, and probably in a few years, Federal investigators will be tracing in great detail. Unless Congressional Republicans and the few honest Democrats do their job and vet Eric Holder. We know the media won't do it, it will just keep on repeating the fluff about Eric Holder's historic appointment as the first Black Attorney General, as if that's supposed to make us forget FALN, Elian, Global Crossing, the Weathermen pardons and Marc Rich. It's time for Congress to take a stand against Eric Holder and for integrity in the Justice Department. Part of me is stunned that people seem to look at the fact that most of his associations are all criminals. Then again, 18 of the Clinton's associates were all killed by gun shots or committed suicide. The only person I remember questioning that one was Rush Limbaugh. We're in for a seriously tough 4 years and it's not the economy that will be the final blow. Wow. I had no idea Holder had anything to do with Elian Gonzalez. Who can forget that picture seen 'round the world of US soldiers pointing an assault rifle at the terrified little boy. I guess no matter how physically attractive or educated they are Obama anyone Obama surrounds himself with are evil at their cores. It would be nearly impossible to find even one politician who is not a criminal to some extent. Patriots ceased long ago it seems. Holder looks to me to be Obama lite. Didn't Narcissus fall into the pool? Stedman is Oprahs cover up boy friend. LOL. Right you are! He does look like Oprah's pretend boyfriend Stedman. Those two will never get married and everyone knows why. As the shady Obama administration? I definitely see another Vince Foster scandal down the pike. Hey! If he didnt pardon the weathermen who would be in Obama's group today? Huh?? answer that smarty pants. now we have Holder pardoning New Black Panther thugs "guarding over" the entryway of a polling station, dressed in military garb, boots, one with a billy club. It's open season!